Do you think you would benefit spiritually by spending thirty hours in prayer and meditation? Yeah, right, you are likely thinking. Where would I find time for that? I’m a very busy mother. Motherhood has its ironies. When we are pregnant and feel the need to “rest up,” sleep is often hard to come by. Having children requires lots of energy but time to recharge our batteries is almost non-existent. Often, it is when we have children that we also develop the desire to grow spiritually, understanding our awesome blessing/responsibility and need for God’s help. But by then, free time is little more than a faded memory from our single days. Yet, every mother also knows that time is valuable and a lot can be packed into a short time. Donna-Marie Cooper O’Boyle is a wife, mother of five children, catechist, and EWTN TV host who understands the ironies. She also understands that if a mother doesn’t make time for prayer and reflection, it won’t happen. So, Donna-Marie has developed a short but concentrated book of daily retreats for busy moms to help them refresh their spirit in between their responsibilities—and all in just five minutes. 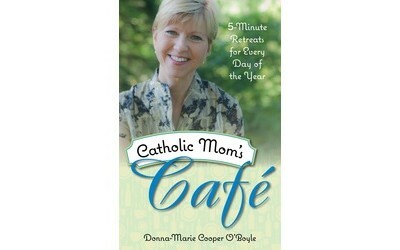 Catholic Mom’s Cafe: 5-Minute Retreats for Every day of the Year is a 365-day devotional book for moms with daily reflections that highlight the virtues of faith, hope and love. Each day of prayer and meditation takes only five minutes so it’s actually doable for even the busiest of moms. Five minutes upon rising in the morning, with a cup of coffee, or during kids nap or playtime can be slipped into any schedule. Over the course of a year, that adds up to 1,825 minutes or 30.4 hours. The mini retreats are a power-packed few minutes with quotes from the Bible, a spiritual reading or quotes, an engaging meditation and a prayer that relates to the daily theme and brief “sound bite” to ponder throughout the day. Our children are already a part of us, but as we grow together in the blessedness of a family we become even more entwined on the journey that is our lives. One afternoon when my son Joseph was little, he made a pit stop to my lap after a busy morning playing. There he laid his little body against me to take a break and check in with Mom. As he gently closed his eyes, I ran my fingers soothingly through his hair. “Better than chocolate,” he whispered. “What was that Joseph?” I wasn’t sure I heard him properly. “Better than chocolate!” he repeated. Lord Jesus, grant us an increase in the beautiful virtue of love. Help us to be sensitive to the needs of our family as well as those we encounter daily. Blessed Mother Mary, teach us how to love. Act of Love, Our Father, Hail Mary, Glory Be. A mother’s love is better than chocolate! There are many ways to pray and of course our own individual communication with God is important to develop a meaningful relationship with him. This collection of inspiration can add to that relationship. Donna-Marie provides a structure so we don’t have to think about it beyond grabbing 5 minutes somewhere. Through the concentrated 5-minute retreats, the time adds up and at the end of the year, we will have the fruits of that time: 30 hours of spiritual growth. And that is certainly worth a few minutes a day.